Acting Gov. Víctor Suárez and PRIDCO Executive Director Antonio Medina participate in Thursday's groundbreaking ceremony. Acting Gov. Víctor Suárez and PRIDCO Executive Director Antonio Medina participate in Thursday’s groundbreaking ceremony. SolarTech Universal, a solar energy company, announced Thursday the development of a state-of-the-art automated manufacturing facility for solar panels in the municipality of San Germán. The project will generate approximately 180 new jobs, company executives said, flanked by government officials. “We’re very excited to have this opportunity to become a part of the Puerto Rican manufacturing community. We’re thrilled that we are able to deliver the future of renewable energy to the island,” saod Boris Rosenstein, CEO of SolarTech Universal. 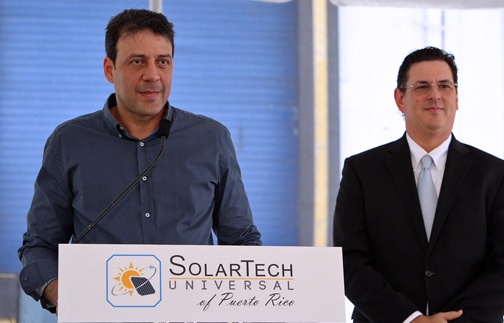 SolarTech Universal will invest in machinery, equipment, working capital and leasehold improvements on the property selected for the operation, owned by the Puerto Rico Industrial Development Co. The site is expected to produce more than 300,000 high-efficiency solar modules per year. The solar panels manufactured by SolarTech Universal in Puerto Rico will be sold locally, as well in the Caribbean and the U.S. market. PRIDCO is promoting the project with incentives associated with job creation and infrastructure improvement activities. “With this project, we introduce a new manufacturing member to Puerto Rico’s industrial footprint, reactivating an old industrial facility and expanding the island’s capabilities to develop renewable energy technologies,” said PRIDCO Executive Director Antonio Medina. Once operational, SolarTech Universal will be the only Puerto Rico-based solar panel manufacturing group for the Florida-based group that has successfully developed another solar panel manufacturing plant in West Palm Beach. SolarTech Universal works in partnership with Meyer Burger, one of the world’s highest regarded designer and builders of panel manufacturing production lines. “Beyond attracting economic development, this administration has focused on attracting pioneering industries that go in line with global trends and that, similarly, offer jobs that are beneficial for our people,” said Acting Governor Víctor Suárez, during Thursday’s groundbreaking ceremony. Hey Buddy!, I found this information for you: "SolarTech Universal announces M investment". Here is the website link: https://newsismybusiness.com/solartech-announces-investment/. Thank you.